"Though Mr. Prey's voice was a mellow, lyric baritone, he sang with such focused sound and robust projection that he enjoyed an active career in opera. He avoided the heavier Verdi roles, but excelled at Mozart, Gluck, Rossini, and lighter Strauss and Wagner roles. 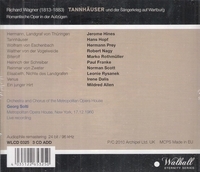 One of his great achievements was Beckmesser in Wagner's MEISTERSINGER, which he sang at the Met in 1993. To his characterization of a town clerk in medieval Nuremberg, typically portrayed as a scheming buffoon, Mr. Prey brought an emotional complexity and light-on-the-feet comic grace that made Beckmesser endearing. Mr. Prey's voice was ideally suited to lieder, and he left a large and important discography, including songs by Schubert, Schumann, Strauss, Mahler, and Carl Loewe, a neglected 19th-century composer whom Mr. Prey championed. Commenting on Mr. Prey's 1985 recording of Schubert's WINTERREISE with the pianist Philippe Bianconi, The New York Times critic Bernard Holland wrote: 'This is Schubert singing that does not twist sound for pictorial or dramatic effect but instead creates, with unusual musical clarity and purity of tone, a narrative voice which, though concerned and moved, tells the story first and lives it only indirectly'." "The opening phrases of 'Dich, teure Halle' are flavored with [Rysanek's] trademark vigor - when she can soar, we travel with her....communication and character revelation are always Rysanek's formidable assets. As Venus, Dalis offers one of her best broadcast portraits, her vocalism strongly colored in the lower range and firmly anchored on high. Her handling of text and musical nuance is exemplary, seduction seems plausible, and a searing top tone puts the cap on the Venusburg episode." "Marko Rothmuller, who made his Metropolitan Opera debut in Wagner's MEISTERSINGER in 1959, had a singing career that began with Weber's FREISCHUTZ in Hamburg in 1932. He rejoined the Met's company for the 1964-1965 season. By then, he had been appointed a professor of voice in Bloomington, where he started teaching in 1955. He was a native of Croatia, and studied at the Zagreb Music Academy. He went to Vienna to train as a singer with Franz Steiner and study composition with Alban Berg; the title role of Berg's WOZZECK became a signature piece. He studied for that role with Erich Kleiber, who conducted the Berlin premiere of WOZZECK in 1925. After his engagement at the Hamburg Opera, Mr Rothmuller established himself as one of Europe's most promising baritones, scoring successes particularly in works by Wagner and Verdi. Because he was of Jewish descent, he left Germany in the early 1930's to sing in Zagreb and Zurich, where he appeared regularly until 1947. His European engagements then took him to the Vienna State Opera, Covent Garden and the Glyndebourne Opera at the Edinburgh International Festival of Music and Drama. "With the end of the war Solti was appointed musical director of the Bavarian State Opera in Munich in 1946. In normal circumstances this prestigious post would have been an unthinkable appointment for a young and inexperienced conductor, but the leading German conductors such as Wilhelm Furtwangler, Clemens Krauss and Herbert von Karajan were prohibited from conducting pending the conclusion of denazification proceedings against them. Under Solti's direction, the company rebuilt its repertoire and began to recover its pre-war eminence. He benefited from the encouragement of the elderly Richard Strauss, in whose presence he conducted DER ROSENKAVALIER. In 1961 he became musical director of the Covent Garden Opera Company, London. During his ten-year tenure, he introduced changes that raised standards to the highest international levels. Under his musical directorship the status of the company was recognised with the grant of the title 'the Royal Opera'."